Despite the sweltering heat of Varanasi, and the hectic campaign that he has been running with Aam Aadmi Party founder Arvind Kejriwal for the past few weeks, AAP leader Manish Sisodia manages to steal a moment for everyone who wants his attention. It could be in the form of a smile, a wave, an encouraging pat or even a morning walk at 5 am every day. He is proud of the AAP campaign in Varanasi, of the volunteers who have flooded the city and, in a campaign that has included a mix of the traditional and the modern, convinced the Benaras voter to take Kejriwal and his party as a serious contender in the constituency. 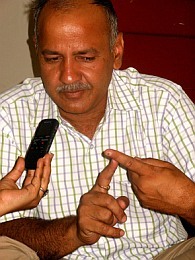 As the countdown begins to D-day, Sisodia discusses the elections and the rivals AAP hopes to defeat on May 12, in an interview with Savera R Someshwar/Rediff.com. We are in the last phase of the elections. How do you assess the Aam Aadmi Party's chances across India? We have done our best in the last 2, 3 months. Now let us see. We are in a neck-to-neck fight in at least 100 seats. Which of these seats does the Aam Aadmi Party consider most essential when it comes to victory? All seats are important for us. The candidates have really worked very hard and we have a fair shot at a win. If you ask me politically, however, two seats are very important for us -- Amethi and Benaras (Varanasi). We want to change the political system in this country. In order to do that, we need to win these two seats. 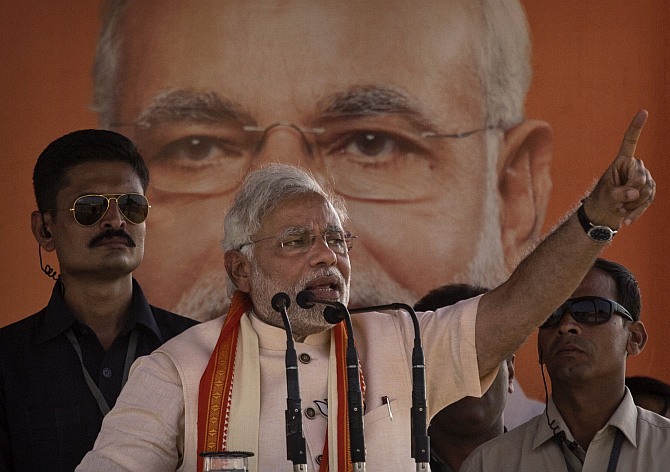 Image: BJP leader Narendra Modi at a rally in Rohaniya, near Varanasi. Today, two kinds of politics take place in India. One is clean politics. It is focused on social service and on the need to change the system. The second kind believes in paise se satta, satte se paisa (money begets power and power begets money). This is the game played by parties like the Congress and the Bharatiya Janata Party, which each heads its own coalition. The steering head of the BJP-led National Democratic Alliance is contesting the election here in Varanasi. The steering head of the Congress-led United Progressive Alliance is contesting the election from Amethi. In dono ko harana hain! (Both these people must be defeated)! If they can be defeated, it will prove that politics in India is finally changing. What kind of vibes are you getting in Benaras? Initially, when we came here, we had to battle pre-conceived perceptions that had been created by the media. Things like, Benaras is a Hindu city, so Modi will definitely win here. But when we went to the people, we found that there was a zameen-aasman ka antar (huge difference) between what the television sets were saying and what people were saying. In the last one month, we have connected with the people of Benaras. It is now a neck-to-neck fight with the BJP here. The people who are saying this would, if they could, make Modi the prime minister of this country without the bother of going through an election. What, according to you, is the ground reality? The reality is that there is a neck-to-neck fight in this constituency. Let us see what happens on May 12. 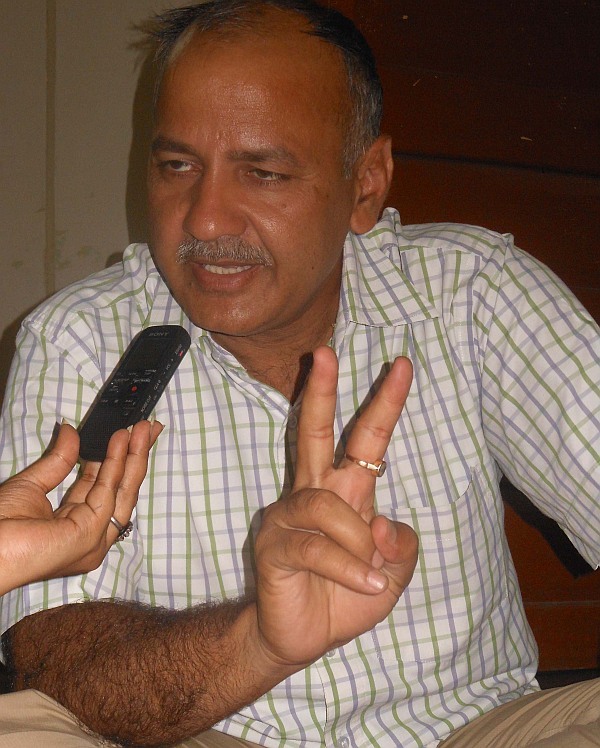 Image: Aam Aadmi Party leader Manish Sisodia. What about the Congress and the Samajwadi Party, which heads the government in the state? Do they feature in the equation at all? The Congress and the SP have lost their ground. As for Modi, he is surviving on advertisements, the media and his money power. Just check the newspapers every morning; the headlines are designed in a manner to convince the reader that Modi will win this election; look at the kind of language used. If the media stops this lopsided behaviour, there will be a huge change. According to those elements of the media that indulge in this kind of behaviour, there is no point in having this election at all. According to them, the money spent on these elections is a complete waste. Yes. But if you ask them to put their hands over their hearts and speak the truth, they will ask you why you are wasting so much money. As far as they are concerned, Modi has already won this election. What happens when the media praises the Aam Aadmi Party? Is the media then not being judgemental? I am not criticising the media for showing the BJP in a positive light. Par aap Modi ko jita rahe ho (But you have already declared Modi as the winner). Look, I am going to tell you. The day Mukhtar Ansari (of the Qaumi Ekta Dal) announced his support for Ajai Rai (the Congress candidate for Varanasi), a popular Hindi newspaper ran a headline saying, Kejriwal ke haath se Dilli ke baad Benaras bhi nikla (After losing Delhi, Kejriwal has lost Benaras). Isn't that being too judgemental? This reporter and his newspaper have decided that Kejriwal has already lost the election in Benaras because one Mr Ansari has supported one Mr Ajai Rai. How can a reporter be judgemental like this? Many other news organisations have reported that Ansari's support could mean that the Muslim vote would go to the Congress. Has the reporter decided this based on any kind of fact or has he simply expressed his own opinion? It was his desire, or the desire of his employers, which came through in that headline. The result of the Delhi poll is not out yet, and you are giving a judgement that Kejriwal has lost Delhi. And, based on one man's support for another, they have made the judgement that Kejriwal has lost the election in Benaras as well. One of the leading newspapers in the country has written this. Amar Ujala. I can show you headlines that are much deadlier than this in Dainik Jagran. I have been a journalist. I can read between the lines. I can point out where the headline has no connection with the news item that follows; what substance the story has. This happens regularly with Dainik Jagran. If they had their way, they would have already made a board and hung it outside the prime minister's office identifying it as Narendra Modi's place of work. 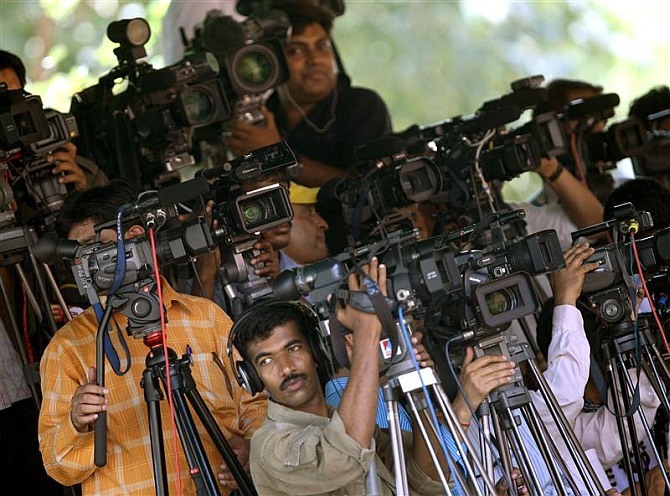 Image: Media persons covering an election rally. 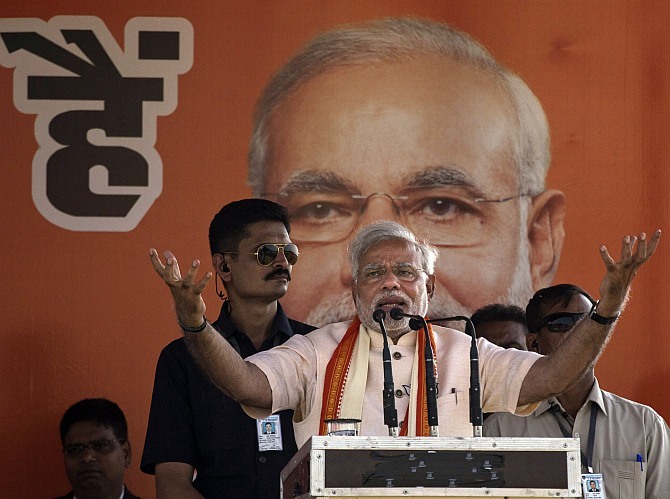 Does your party see a Modi wave in the country? Not at all. You only see a huge Modi wave in the country when you sit at home and watch television for a couple of hours. When you go and actually talk to the people, a lot of dynamics come into play. What are the dynamics that are affecting Varanasi? Local issues like civic facilities. Roads. Homes. Education. Health. The state of the hospitals. Sewers. The weaver issue. Gangaka issue hain. Besides, Varanasi faces the same problem every other city in India faces -- corruption and bribery at every level. What about the fact that the Aam Aadmi Party is seen as an outsider? We are a new party. So many people feel we lack experience. The media too never fails to highlight this fact. I have asked people many times... what kind of experience don't we have? The experience of purchasing streetlights worth Rs 5,000 for Rs 37,000 like Sheila Dixit did? The same streetlights were bought by the BJP for Rs 31,000... Woh anubhav hamare paas nahi hain (we don't have that kind of experience). We don't have the experience of taking commission to sell coal mining rights and spectrum rights. As far as the people who are 'experienced', what kind of experience do they have? In the last 65 years, have they managed to ensure that every Indian has access to drinking water at the very least? What is the use of all the experience that they claim to have if they cannot ensure the supply of clean drinking water even to those people who live in the capital of the country? Aisa kaisa anubhav hain yaar (What kind of experience is this)?" What is the use of all the experience gathered by the BJP, which has been heading the Delhi municipality for so many years, when Delhi's roads are filled with filth? They have headed the municipal corporation in Benaras for the last 15 years. And for the last 15 years, Benaras's roads and by-lines are rotting. Benaras's 31 sewers are releasing their waste into the Ganga. Is this what is called experience? If this is 'experience,' then we hope for God's sake that we never become an 'experienced' party. 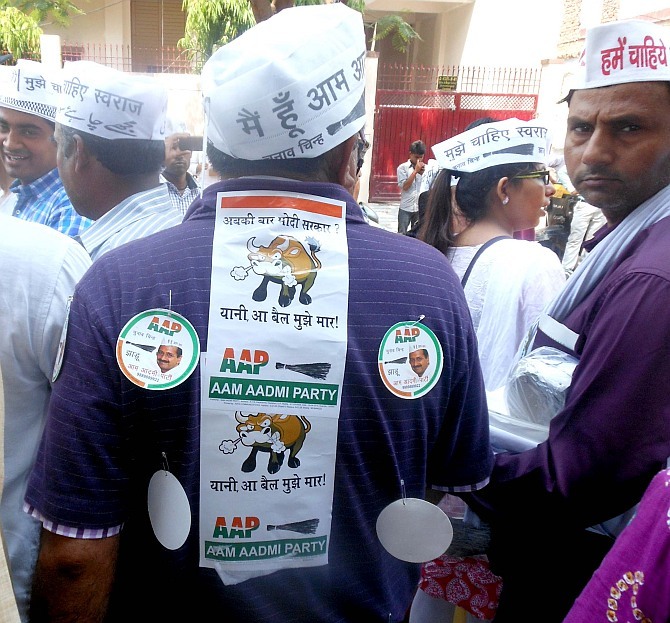 Image: AAP supporters at a road show in Varanasi. Elections in India are fought on grounds of caste, creed and religion. How do you avoid that trap? We have said repeatedly that this our most challenging task. Whenever we talk about corruption, these so-called anubhavi log (experienced) people start dividing society on religious grounds. Don't you feel that there are many voters who don't want to buck a system they have been following? That they will vote for a particular party because that's what their family has been doing for generations. Or they will vote for a particular party because that's what their community leaders have decided. I don't accept this. If this were true, only one political party would have ruled India from the time we became free. Why do voters then vote for other parties? Why is there an anti-incumbency factor? Why do candidates change? They do not change because there is a religious mindset. People are rising above the caste mindset, the religious mindset and searching for a lot more in politics. And, each time, they are being cheated. Today, we have 117 political parties in the country. The voters are playing a desperate game of musical chairs, but continue to suffer irrespective of which party comes to power. You claim to belong to a party interested in improving the social fabric, but all you are interested in is perpetuating your dynasty. What is inside is the same; it's just that the packaging has changed. The problem does not lie with the people's mindset. Where are the leaders? What is the difference between Rahul Gandhi and Narendra Modi? Rahul Gandhi has turned the Congress into a part of the Ambani empire. Modi is ready to become part of the Ambani-Adani empire. This is the only difference. We go to everyone. We have approached people of all religions, castes and creeds. We go and meet religious leaders; we got and meet community leaders. But I will tell you the difference. We are bringing everyone together to fight corruption. If we are bringing the Muslims, we are bringing the Hindus as well. If we are bringing the Dalits, then we are bringing the upper castes and the lower castes as well. Aap ko sab ke saath aana padega (You will have to walk along with everyone). You don't have any other option. Hum sabko kehte hain ki aap sab ke saath aao (We want everyone to join us). But when Mulayam Singh Yadav goes to the Yadavs, he asks or their vote because he belongs to their community. We say the Yadavs will have to come with us. The Dalits have to come with us. The Brahmins have to come with us. They don't have any other option. We are gathering everyone, bringing them together. The Aam Aadmi Party has succeeded in creating a new vote bank that has cut across the religious lines, across caste and creed lines. Inke ankhon mein sirf ek ache Hindustan ka sapna hain (They only dream of a better India). That is our vote bank across India and in Benaras as well. Image: AAP leader Arvind Kejriwal during a roadshow in Varanasi. But you are facing a lot of violence here. I would not call it violence; I would call it arrogance. Of course, woh haathapai karte hai, maar-peet bhi ki hai (they indulge in violence). Ghabragaye hai woh log, bhauklahat hai (They are frightened; there is a lot of confusion). So they throw eggs at us; they beat up our volunteers. What role do you see for the AAP after the election? It is not before or after. Our role is to clean the political system and that is what we are doing. We will continue doing the same thing. Do you see any change or any widening of the scope of AAP? Change... widening... these are processes. We don't stick to processes. We focus on targets. Our target is to clean and change the politic system and that we are doing. I spoke to some of your volunteers in Varanasi. They have come from all over India. People have quit jobs, left behind families to devote themselves to work for what they believe in. They have certain expectations from the party. What happens to them after the elections? I don't know. Yeh sirf mujhe thodi sochna hain (I am not the only one who has to think about this). We all have to think about it. How will this country change? Is what we have done enough or will we have to do something more? All of us have to think about it. If you have to choose between the Congress and the BJP, which in your opinion is the worse party? Who has the worse leader? (Laughs) I don't think one can choose between the two. They are part of the same problem. Both may have good people, but policy makers and leaders in both the parties are equally corrupt. They don't have any passion, any vision for the country. They don't have any affection for the people who live in this country. They have just one vision... chair and money. 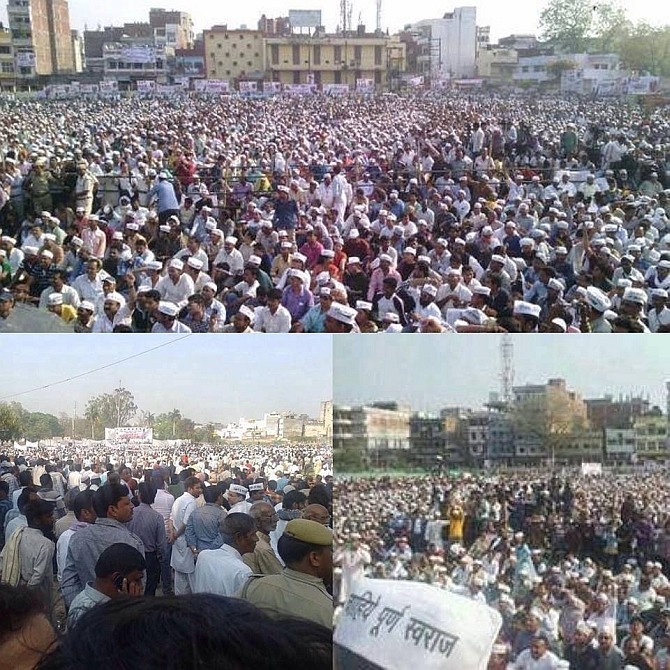 Image: The gathering at an Arvind Kejriwal rally in Varanasi. What is the worst aspect about Modi? The worst thing is that he does not have a solution to any problem. Even when he speaks about Gujarat, he lies. Amul was not developed by him. Gujarat's roads were never developed by him. Whatever he talks about Gujarat, especially about his own contribution to the state government, is just a bunch of lies. Logon ko uksate hain (He scares people). Virtual enemy create karke uksate hain (He creates virtual enemies and scares people). Yes, Pakistan and China are threats to India. But why are you not talking about solutions to these problems? In his interview to The Times of India yesterday, he says there could be a resolution to the problems we face with China. Of course, there can be a possible resolution... But what is it? Are you really contesting an election on these kind of irresponsible issues? Yes, if Pakistan is doing something wrong, we have to get our point across to them in a strong manner, using strong words and strong action if needed. If you are making a speech, talk about these things. We are not stopping you. But you keep shouting about corruption and inflation, you keep shouting about women's empowerment. What are you actually doing about these issues? After increasing the price of gas fourfold, you say bahut ho gaya bhrastachar ab ki baar modi sarkar. You are bringing goondas (goons) and criminals into politics. Don't you have any faith in your development model? Modi has brought in a man like Sushil Singh. If he is supporting Modi in Varanasi and Modi wins, woh Modi ki aarti nahi utarega (he will not praise Modi). He will demand his pound of flesh. He will take all the contracts here. He will do goondagiri in Modi's name. Can't Modi see these things? The Gandhis have lost all their credibility. This country has given lot of faith to this family, a lot of respect to this family, but they have always betrayed it. Khud ko pala hain (they have looked after their own interests) and they have created a big coterie around themselves. They have shut their eyes to the problems of his country. Girls are raped and they have nothing to say about it. There has been corruption on such a massive scale under their rule -- their own people were involved in the Bofors case. Even if we ignore that, there have been major scams like Coalgate. Do you know what views Rahul Gandhi or Sonia Gandhi have about the coal scam? Do you know what their views are about the rising price of gas? They have disconnected themselves from the problems of this country and the people of this country. How would you explain the fact that your government in Delhi did not complete its term? Many of your party's admirers have felt let down by this decision. They felt you should have dealt with the problems by staying within the system. The problems of this nation cannot be solved by 28 MLAs. If you want to solve Delhi's problems, you need a government that is supported by at least 36 MLAs. There have been many different options about whether we should have resigned or continued with the government. Many people felt it was an unnecessary sacrifice. Some of our leaders have said we should have resigned in a different manner. That I agree. But resign toh karna hi tha (we had to resign). We could have asked the people for their opinion. We could have spent a couple more days discussing the timing and manner of the resignation. But we had no doubt about the fact that we had to resign. That has worked against your party in this election. The BJP, and that includes a section of the media that has become BJP-'fied', have run a campaign for more than a month ki chhod gaye, bhaag gaye (we ran away from our responsibilities). But, wherever this issue has been raised and we have been able to speak for even a couple of minutes, we have been able to convince people about our reasons. It is true that we have not been able to communicate our reasons in the right manner. We have not got an opportunity to do so, the media has not been fair and the BJP, of course, has a stake in this. Which government do you see at the Centre? Right now? I don't know, but I do know it won't be a majority government. But who will form the government. You are a seasoned journalist. You can make an educated guess. Who do you think should come? Will AAP lend support to any government at the Centre? 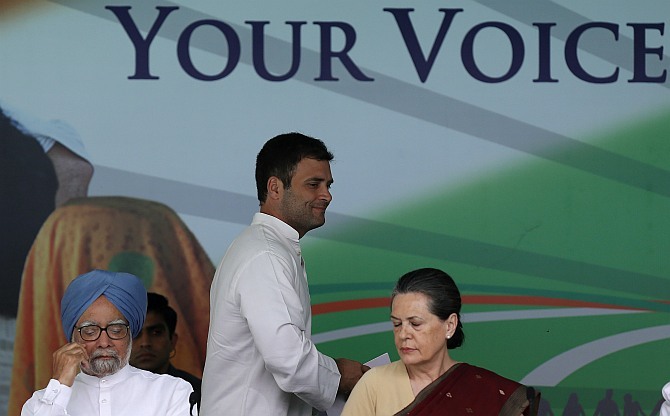 Image: Congress Vice-President Rahul Gandhi with his mother Sonia Gandhi and Prime Minister Manmohan Singh.